(Nanowerk News) An ultra-high-resolution imaging technique using X-ray diffraction is a step closer to fulfilling its promise as a window on nanometer-scale structures in biological samples. In the Proceedings of the National Academy of Sciences, researchers report progress in applying an approach to "lensless" X-ray microscopy that they introduced one year ago. They have produced the first images, using this technique, of biological cells – specifically the intriguing polyextremophile Deinococcus radiourans. Better ability to see nanoscale structures in cells could yield important insights for evolutionary biology and biotechnology. In the case of D. radiourans, for example, it could help to settle questions about whether – or how – the structure of this organism's DNA-bearing nucleoid region accounts for its hardiness against ionizing radiation. Having demonstrated the resolution, reliability, and reproducibility of their technique, the researchers are now working to extend it to three-dimensional imaging of biological cells. 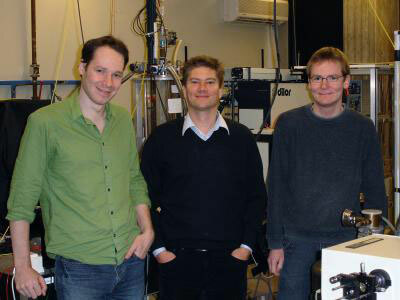 Technische Universitaet Muenchen biophysicists (left to right) Dr. Pierre Thibault, Prof. Dr. Franz Pfeiffer, and Martin Dierolf are co-authors of the PNAS paper, "Quantitative biological imaging by ptychographic X-ray diffraction microscopy." X-ray imaging is best known for its medical applications, such as traditional radiographs and CT scans. Yet the use of X-rays goes far beyond routine imaging. In particular, the very short wavelength of X-ray radiation allows various modes of microscopy that can reach the nanometer resolution. One of the main hurdles to high-resolution X-ray microscopy is the difficulty of producing high-quality X-ray lenses. To overcome these difficulties, so-called "lensless" microscopy methods have emerged in the last decade. A technique developed by researchers now in the biomedical physics group at Technische Universitaet Muenchen (TUM) has shown great promise for ultra-high resolution imaging of materials and life science samples. This imaging technique, called ptychography, was first introduced in the 1970s for electron diffraction. It consists in measuring full far-field diffraction patterns as a small illumination is scanned on a sample. While its use in electron microscopy is still limited, ptychography has gained tremendous popularity in the X-ray imaging community in the last few years, thanks to the development by Franz Pfeiffer, now chair of the biomedical physics group at TUM, and his team. A critical step in the development of ptychography was published by the team one year ago in Science. The super-resolution capability of the imaging method was successfully demonstrated with a gold test structure. Now a collaboration of the Pfeiffer group, together with researchers at University of Goettingen and at the Swiss Light Source (Villigen, Switzerland), has gone a step further and produced the first images of biological cells with the same technique. These results, published in the Proceedings of the National Academy of Sciences, show that lensless X-ray imaging, in particular ptychography, can be used to obtain accurate maps of the electron density forming a biological sample. This type of quantitative measurement is extremely difficult with most other high-resolution techniques currently available. Moreover, biological samples are very fragile and nearly transparent to X-rays, making this type of accurate measurement even more challenging. The Pfeiffer group is now moving beyond this success and looking into ways of improving the technique further. In particular, the team is aiming at the next milestone: three-dimensional imaging of biological samples.